Dying fabric naturally has been on my wish list of crafty techniques to try for many years now. The girls and I have tried it out with our eggs before, but that is as close as I’ve come so far. You can see I’ve been doing a bit of research and collecting my findings here. I think it just felt like a bit much- too much water, dye, mess, too many steps, etc. with little ones around. I have been slowing inching closer to finally just trying it now that our youngest is almost 4 and old enough to play on her own/with sisters, or safely watch from a distance if needed, I figure it’s time! 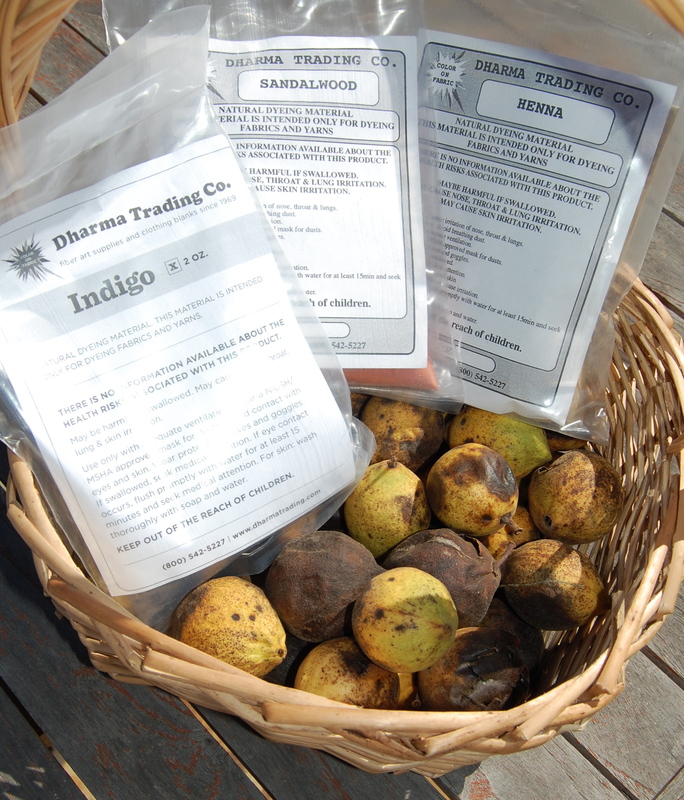 I put in a little order at Dharma Trading to get me started(mmm, these little packages even smell good- like your spice drawer) and a lovely parent friend at our school collected some walnuts(for the shells) in the park. I have been able to get lots of pointers and tips from our amazing Waldorf school community of knoweldgeable teachers and parents with experience, as well as this incredibly inspiring blog and crafter/artist, and now I feel I’m ready to jump in and get my feet wet- literally! I will start with some cotton(which I’m told can be a bit tricky). I also have some silk I’ve been hording for years to try this with. I can’t wait to see what colors emerge, and of course will be back to show you all some results- successful or not- Ha! How about you? Is anyone else finding a calling to experiement with natural dyes to use in your quilting/crafting projects? I know it’s quite an involved process, but for anyone who has tried it, would you say it has been rewarding? Did you get good results? I’m open to any tips or suggestions. Hope you’re all having a lovely week so far!! i don’t have any good tips, but my dad dyes wool fabric with cushing dyes and they turn out beautifully!!! he gets some really RICH colors. depending on what dye you are using, leaving it in longer makes the color richer and darker. I’ve been wanting to try this too, so now I am saving onion skins because I like the natural part of dying. Looking forward to your posts! I would start with something other than indigo. Indigo requires a few steps and can be intimidating at first. You can set up a fermentation vat that can be reused if you decide you want to use indigo a lot. My other piece of advise is to use the actual plant material rather than powdered forms of natural dyes. I do not trust where they are manufactured and what is added to them. I think they are just as bad as the other chemical dyes. Try madder root for great color fast oranges, logwood shavings for purple, and cochineal (an insect) for pinks/crimson– great colors without difficulty. Happy to answer questions—- love to see more natural dyes being utilized. I remember when I was little my mother had friends and me dye fabric with onion skins, beets and other things. It was fun for us then and I’d love to do it again.